Passengers travelling on a coach were no doubt fuming after one amongst them mistook an electronic cigarette as a terror threat. The e-cigarette, which police later described as "a health aid for smokers", was being used by a passenger on a London bound coach belonging to Megabus. There are various versions of the device but essentially they contain a battery with either a cartridge or small tank that has liquid in it. But the presence of vapours prompted one passenger to fear the worst and call the police. The police told the passenger to hand the phone to the driver who was then ordered to pull over on the hard shoulder of the M6. A huge security operation was then thrown into action. 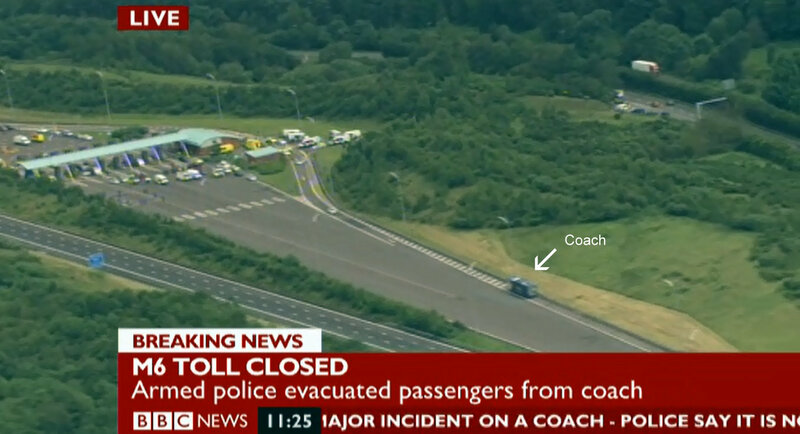 Dozens of police units, ambulances, fire appliances and bomb disposal officers descended on the scene and the motorway was closed off in both directions. 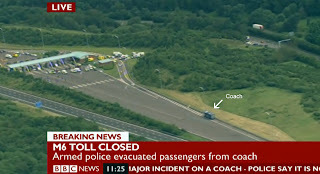 Passengers were taken off the coach, searched and made to sit in a cordoned off area, guarded by armed police officers. "We were told to sit in rows and not talk to each other," one passenger Jenny Lister said. BBC and Sky News both swung into action providing saturation coverage of the events on the ground. M6 also became a top trending topic on Twitter with speculation by some that the smoke seen was likely someone making a pot noodle or cup of tea. It was several hours later before the all clear was given and the road was reopened. And while there was some criticism, especially on Internet forums and Twitter discussions that the police had overreacted, the police insisted that they had "responded swiftly and proportionately" to a credible and "genuine report" [BBC / Sky / Daily Mail / Sun front page]. While the whole exercise proved to have been unnecessary, should the threat have been real any lesser response would have also been criticised. Indeed the incident acted as an important test run for emergency services. The threat of a real attack was reinforced earlier in the day after the Metropolitan Police raided several addresses in the London area and arrested 6 people suspected with terror offences [Guardian]. Five men and a woman were arrested in London as part of what police described as an intelligence-led investigation involving MI5. One of the six, who are aged between 18 and 30, was Tasered by police. Eight homes in west, east and north London and one business were searched. The arrests related to a possible plot involving Islamist extremists, with potential UK targets, although police did not suggest that the Olympic Games, less than a month away, was the target. Three of those held are brothers, aged 18, 24 and 26, and were detained in Abbey Road, in Stratford, east London, during an operation involving armed officers. One is said to have been an ex-police community support officer based in Ealing. He served with the Metropolitan Police for more than two years before resigning in September 2009. However police say the man had not been "deployed in any specialist or sensitive roles". The brothers were named as Jahangir, Mohammed and Moybur Alom. Also arrested was Richard Dart, a Muslim convert who uses the name Salahuddin al Britani. He features in a YouTube video which criticises the Royal Family and British military action in Muslim countries [BBC / Sky].